(2013/4/1) Pyongyang Racer is online and working! Koryo Tours posted the game online on December 18 2012. Sorry folks, if you have been trying to access our website it appears someone has tried to hack us and it is currently off line. Someone is not playing fair game here. If you have any questions our emails are still up and running. It will be up and running again soon sorry. We could use it now as a new year gift to you all. The Koryo Tours website was back online several days later. The Pyongyang Racer game was not. (Edit: The game presently - Jan 5 0850 GMT - is not loading when I try it. The load bar gets to the n in loading and then stops. Pyongyang Racer game has been moved to pyongyangracer.co and is under maintanence, but should be up and running soon! still under maintanence - coming soon! February 9: Pyongyang Racer post has been removed from the Koryo Tours facebook page. Pyongyang Racer game still not loading at its website URL. Koryo Tours website continues to state: still under maintanence - coming soon! "Hacking group Anonymous_Korea claimed they have taken down five of North Korea's official websites ..... The sites included the Korean and English language versions of the Democratic People’s Republic of Korea, the North Korean Committee for Cultural Relations and the state-owned airline Air Koryo .... The group later tweeted the attack was still under way.... "
And Pyongyang Racer is back online. Probably it wasn't exactly hacked, but more like "Anonymous_Korea" and their followers flooded the websites with traffic, temporarily overwhelming them. Koryo Tours Pyongyang Racer is a small racing game developed in the DPRK (North Korea). 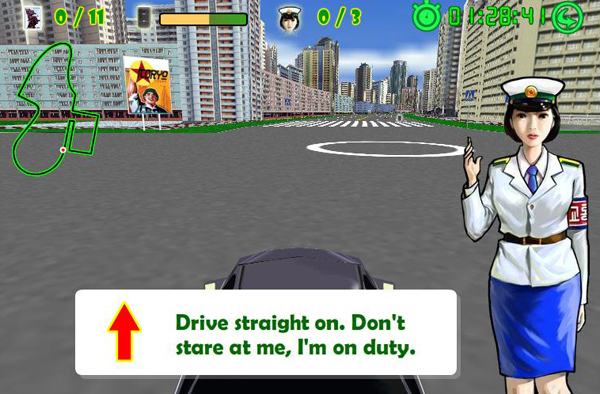 This game was developed in 2012 and is not intended to be a high-end technological wonder hit game of the 21st century, but more a fun race game (arcade style) where you drive around in Pyongyang and learn more about the sites and get a glimpse of Pyongyang. You will drive a long journey through Pyongyang. On the journey there will be special sites that you can see, but you should also collect the items that appear close to the sites! Don’t forget to collect enough gasoline during your journey! If you drive recklessly there will be a Traffic Girl to direct you and if you get too many warnings…….